Who wrote "The Scarlet Letter"? Who wrote "The Adventures of Huckleberry Finn"? Who wrote "The House of Mirth"? Who wrote "On the Road"? Who wrote "The Grapes of Wrath"? Who wrote "For Whom the Bell Tolls"? Who wrote "Gone with the Wind"? 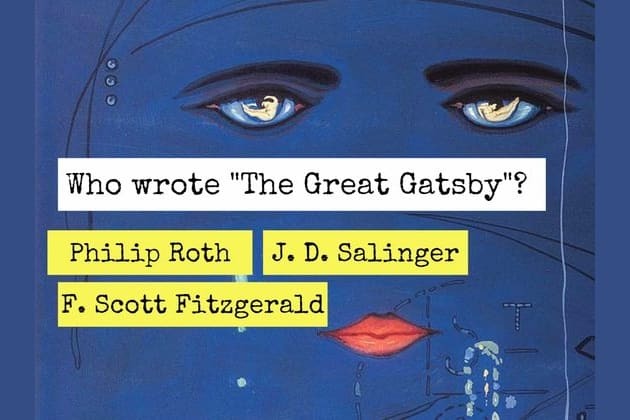 Who wrote "The Great Gatsby"? WOW!! You're in the top 5%!! Hats Off!! You aced a test that only 5% of American woman can pass. You must be an incredibly avid reader. People with your score have an IQ range of 146-154, which basically means you are a hidden genius. Share the news with the world. You flunked this!! You're in the same pool with the majority of the population. How does it feel? Let us know in a comment below, and share the quiz with everyone you know.